Modern-day Churchill and the surrounding area are characterized by sub-arctic conditions. In places around the coast and rivers of this area you can find outcroppings of carbonate rocks that were deposited some 450 million years ago. Back then, much of northern Manitoba was blanketed by a shallow, tropical sea. These rocks contain a diverse assemblage of fossils and record the first mass extinction event that occurred on this planet. over 100km south of the town of Churchill. During the Late Ordovician (450 million years ago) to early Silurian (440 million years ago), carbonate rocks were deposited in the Churchill area of Manitoba, which is part of the Hudson Bay Basin. At this time, the continent of North America was positioned in the southern hemisphere and extended to the equator. The area around modern-day Churchill was positioned very close to the equator, and was covered by shallow, tropical seas. 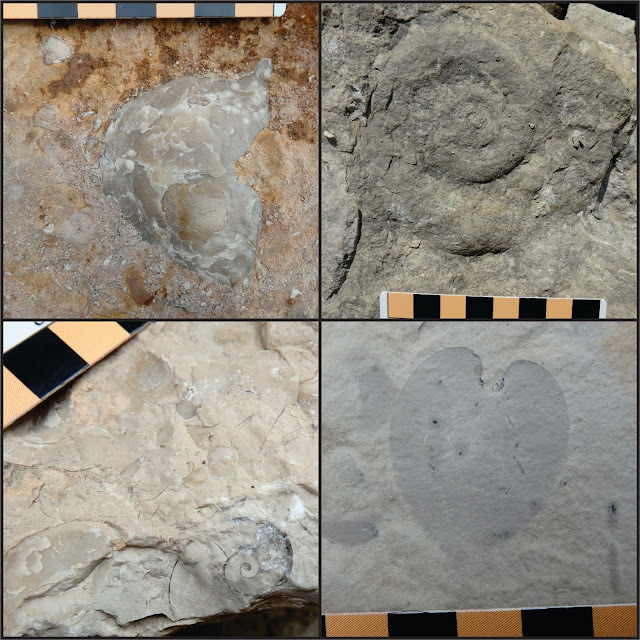 The carbonate rocks around Churchill (and elsewhere in the Hudson Bay Basin) contain a diverse assemblage of fossils; corals, cephalopods, trilobites, bryozoans, trilobites, and brachiopods are some of the common types of fossils found in these rocks. An important evolutionary radiation occurred during the Ordovician Period. This radiation event, termed the Great Ordovician Biodiversification Event, represents a huge increase in marine biodiversity. This event essentially set up the structure of marine ecosystems for the next 250 million years. At the end of the Ordovician Period environmental and climatic conditions changed dramatically. A sudden and intense cold climate led to the destruction of shallow marine environments which hosted the diverse communities that resulted from the Great Ordovician Biodiversification Event. This marks the first mass extinction event which occurred on our planet, and killed off 85% of marine species in a very brief period of time. At the beginning of the Silurian Period (~443 million years ago) marine communities began to recover as environmental conditions improved. The strata of the Hudson Bay Basin in northern Manitoba record the peak of diversity in the late Ordovician, the extinction event, and the beginning of the post-extinction recovery in the earliest Silurian. Along the northern section of the Churchill River there are spectacular outcrops of Late Ordovician carbonates. Travelling by helicopter, we spent a few days flying to these outcrops to study and examine these excellent stratigraphic sections and the diverse fossils within these rocks. like this are a perk of doing geological field work! At the localities we visited, we were able to observe the diverse marine communities that existed in these areas 450 million years ago. They represent the peak of that Ordovician diversification event. The diversity and abundance of these fossils is very impressive! From top left, clockwise: a strophomenid brachiopod, which is a clam-like animal; a mold of the outside of a large, coiled gastropod (snail) shell; a cross-section of a small, coiled cephalopod (squid) shell; an internal mold of a bivalve, a clam-like animal, that coincidentally looks heart-shaped. Scale bar is in centimeters. The fossils from these rocks give us many clues about the environments these sediments were deposited in. For example, a high diversity of animals frequently indicates very favourable marine conditions for life. Specific groups of animals can give us even better clues regarding their original environment. Corals, both tabulate and rugose, are common in some of the formations of rock in northern Manitoba. Corals typically require shallow, calm, warm, and nutrient-rich waters to thrive. By using a combination of the paleontology and lithology (rock type) of the Hudson Bay Basin outcrops in Manitoba, geologists have been able to determine the environments these rocks were deposited in. 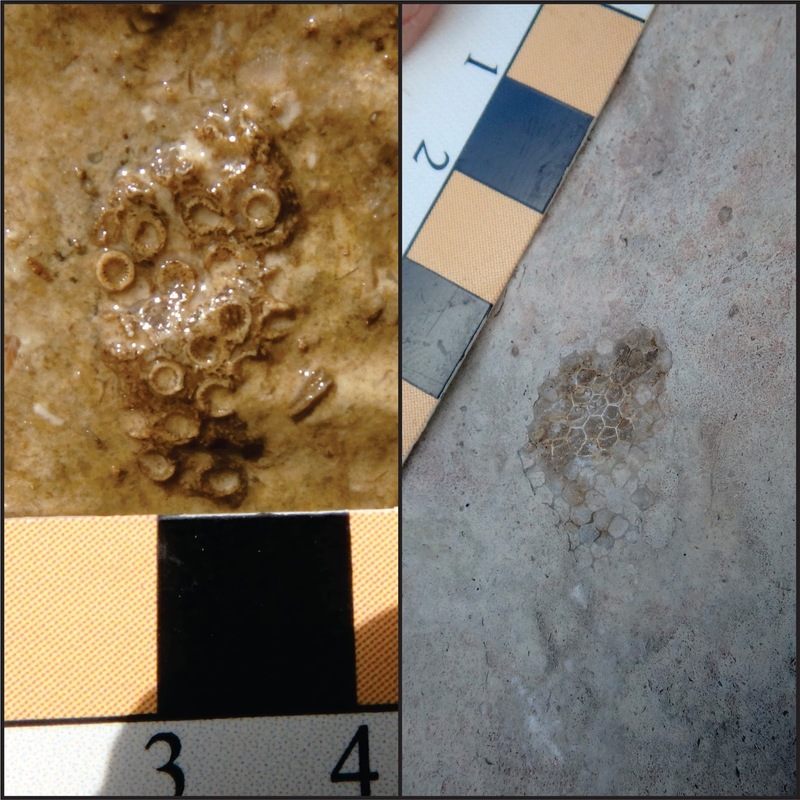 For the most part, these carbonates were deposited in shallow, warm, calm sea waters. In the latest Ordovician, when the global climate cooled, conditions became less favourable however. We are able to see a marked decrease in diversity and abundance in the fossil assemblages of these latest Ordovician rocks. This represents the first mass extinction event, referred to as the end Ordovician mass extinction. The lithology also reflects a period of very shallow water and restricted conditions (which means that there was probably less oxygen in the water and higher rates of evaporation). study and take samples from. Modern-day Churchill and northern Manitoba are characterized by sub-arctic conditions; winters are long and cold, and trees are sparse. The marine waters of the Hudson Bay are cold all year round. However, this is in stark contrast to the environmental and climatic conditions of that area 450 million years ago. If you ever find yourself in Churchill, just remind yourself that in the Early Paleozoic, the entire area would have been a tropical paradise! The Interlake region of Manitoba not only offers spectacular scenery, lakes, and wildlife, but also some incredible geology. From a possible impact crater to ancient Paleozoic fossils to karst topography, the Interlake offers an array of interesting rocks and landscapes. Tuesday was busy. A fellow geologist and myself spent the day roaming around the Interlake area, stopping to check out some important geological sites. The day began with visiting the southernmost outcrop of Devonian rocks (the Devonian Period lasted from ~420 to 360 million years ago) in Manitoba. The site used to be an old quarry, but it hasn't been produced from for a long time. Adjacent to the road in the ditch the Devonian Elm Point Formation is exposed; the surface is very weathered, but grooves made when glaciers scraped over the top of the rock tens of thousands of years ago can still be seen. which direction the glaciers were moving in. These Devonian rocks also contain fairly abundant fossils, the most obvious being brachiopods. Brachiopods are clam-like animals that were prolific during the Paleozoic (540 to 250 million years ago). However, there are still a few species of brachiopods that are currently alive living in deep and cold places in the ocean. I was able to find a couple of brachiopods in a quarry that were fairly well preserved. I also saw many exposed brachiopod beds and cross sections of shells. Brachiopods were extremely abundant during the Paleozoic. These animals are useful in understanding the environment in which they lived and from which these rocks were deposited in. Brachiopods have been used to preform regional correlations, to identify climatic and environmental conditions, to determine approximate water depths, etc. Although there are still a few living today, I wouldn't recommend eating them as they are toxic to humans. In one of the quarries we visited, we checked out an unusual wavy structure in the rocks. These rocks were initially deposited in flat, horizontal layers, and it is unknown what caused this type of deformation to occur. It's also only one of a very few sites within the Interlake to possess this type of structure. On the left side the photo, the horizontally-deposited carbonates have been folded into a wavy structure. We kept travelling northward to Gypsumville and Lake St. Martin. The Lake St. Martin area is of particular interest as there may be an impact crater in the area. The geology of that area is anomalous; much of the Interlake is underlain by Paleozoic carbonates, like limestone. Around Gypsumville and Lake St. Martin there are Precambrian igneous rocks and Jurassic evaporates. Our first stop in that area was to visit the Precambrian granite. It is a truly unique experience to stand on the middle of a hard rock outcrop in the middle of the Interlake. One theory to explain this anomalous outcrop is that an asteroid impacted this area sometime possibly in the Triassic or Permian (between ~200 and 300 million years ago). The force of the impact may have mobilized this granite upward to the surface, from its initial location several hundred meters below this spot. The lichen-covered granitic outcrops and mixed forest makes it feel like you're standing in the Whiteshell, even though this location is some 300 kilometers northwest. We stopped at a nearby quarry, where the Lake St. Martin granite is used for crushed stone. Some of the blasted rocks provided fresh surfaces for us to examine. The granite is a mixture of quartz, feldspars, and biotite, and sometimes contains very large crystals called pegmatites. The granite has a very distinctive pink colour. We also examined an old gypsum quarry in the area as well. Historically, this area has seen a lot of gypsum production, and the quarry we visited was quite extensive. Much of the floor of the old quarry has been flooded, so the numerous outcrops around the edge of the quarry are largely inaccessible. Weathering and exposure to the elements have been wearing away at the very soft gypsum as well. There are still a few places where the exposed gypsum is accessible and not covered by slumped material or vegetation. In the last post I discussed the gypsum deposits around the western edge of Lake Manitoba. Although it is believed that the gypsum around Lake Manitoba and Gypsumville were deposited at the same time and by the same body of water, the geology of the gypsum from both areas are somewhat different from each other. The Gypsumville deposit of gypsum appears, on first examination, to lack silica concretions that have developed in the gypsum west of Lake Manitoba. There is also clearly defined bedding in the gypsum at Gypsumville; layers of gypsum are still oriented more of less horizontally and are easy to spot. It is thought that the possible impact crater in the area would have created a depression in the earth's crust that would have been filled in with ocean water during the Jurassic Period. The gypsum would have been deposited in this crater as the Jurassic seawater experienced increased rates of evaporation. Horizontal bedding is visible towards the top of this section. These are only a few of the many interesting sites around the Interlake. There is a wealth of ancient history contained within the rocks of this region, as well as a few mysteries that have yet to be fully understood. The next time you travel through the Interlake, take a moment and stop to examine an outcrop or bedrock pavement on the side of the road, you might be surprised by what you discover. Gypsum is an important industrial mineral, and has been mined and quarried in Manitoba nearly continuously since 1901. Gypsum is an evaporite mineral that was deposited in a shallow, inland sea that covered Manitoba during the Jurassic Period, approximately 200 million years ago. Along the western edge of Lake Manitoba, and around Gypsumville, gypsum deposits occur very near to the surface. They create a unique landscape of sinkholes, caves, and karst topography. Gypsum is currently being quarried on the west side of Lake Manitoba, but since 1901 there have been multiple mines and quarries in a variety of localities across southern Manitoba. Gypsum is extracted from the quarry using heavy machinery, transported to Winnipeg, and processed into wallboard or used to make cement. Gypsum is a calcium sulphate mineral, with its chemical formula being CaSO4 • 2H2O. Gypsum is often white or grey, but may display a variety of colours. It can be fine to coarse grained, and grows several interesting crystal forms and textures. Gypsum is very soft, so soft that fingernails can scratch this mineral. The term gypsum can also be used to describe a rock composed primarily or entirely of gypsum crystals. Possible replacement texture in gypsum; clays are interspersed through the rock. Edge of rock hammer for scale. Gypsum has undergone a complicated history of diagenesis (shallow, low-grade metamorphism) in Manitoba. Gypsum was originally deposited when a shallow, marine seaway that covered Manitoba in the Jurassic Period experienced increased rates of evaporation due to a hot, dry climate. Overtime, the gypsum was buried by younger rocks and sediments, and was subjected to hotter temperatures. The heat caused the water in gypsum to be driven out of the crystal structure, and the mineral turned into anhydrite, CaSO4. When the anhydrite beds were exhumed and brought near the surface, where they were subjected to groundwater flow. This water re-hydrated the anhydrite, and some of the deposit has reverted back to gypsum. Fractures and veins filled with clay and mudstone through the greyish-white gypsum. Gypsum is an important industrial mineral in Manitoba. The quarried gypsum is hauled to Winnipeg, and processed into wallboard. It is also an ingredient of cement. Because gypsum is economically important, I will be examining known occurrences of gypsum and providing a comprehensive update on this commodity. This will involve reviewing previous studies done on gypsum, current and historical industrial activity, examining core logs, and completing stratigraphic sections and maps of quarries. will be ideal for completing a stratigraphic section. Vertical walls found in this active gypsum quarry provide an opportunity to complete a stratigraphic section. A stratigraphic section is a detailed look at how the geology of a unit of rocks changes upwards and laterally. This allows geologists to preform correlations with other occurrences of similar rocks. It also enables geologists to understand how the depositional environment of these rocks changed over time. Information collected for a stratigraphic section may include mineralogy, fossils, sedimentary structures, mineral textures, and veins/fractures. Representative rock samples are taken too. In the southwestern corner of the province lies the Manitoba Escarpment: a wedge of Cretaceous shales that was deposited in an inland sea that expanded across the centre of North America approximately 80 million years ago. These rocks contain economically important deposits, as well as the remains of prehistoric marine reptiles and fish that inhabited the inland sea. In mid-April, a few geologists from the Manitoba Geological Survey and several people from the Canadian Fossil Discovery Centre went on a two-day field trip to study Cretaceous shale in the Morden-Miami area of Manitoba. We stopped at several localities to examine exposures of different rock units and to look at some reclaimed and active quarries. Among the localities we visited included a paleontologically significant site that is currently being excavated by the Canadian Fossil Discovery Centre. There were great exposures of the Pembina Member of the Pierre Shale at this site. The Pembina Member is composed of black shale interbedded with layers of cream-coloured bentonite beds. The Pembina Member is composed of black shale that is interbedded with seams of bentonite. Bentonite was initially deposited as volcanic ash at the bottom of the sea by volcanoes that were most likely located in Montana. Through interactions with ancient sea water, that volcanic ash has been altered into clays. Historically, bentonite was an important industrial mineral and was quarried in the Morden-Miami area. Bentonite is also used to preform age-dating, allowing geologists to pinpoint the exact age of the rocks (give or take a few thousand years!). The Pembina Member also contains numerous fossils of Cretaceous vertebrates including plesiosaurs, giant turtles, sharks, fish, and the mighty mosasaur. The Canadian Fossil Discovery Centre has many fossils and reconstructed skeletons of these amazing creatures on display. thin, darker-brown beds are bentonite seams. Underlying the Pembina Member is the Boyne Member, which is a buff to grey unit that contains few brown-coloured bentonite seams. The upper part of the Boyne is composed of an upper chalky unit, pictured right, and a lower calcareous shale unit. of this outcrop that is covered by vegetation. At another outcrop of the Boyne we were able to observe the upper and lower units. The units are roughly separated by the Babcock bed, which is a layer of resistive, calcareous shale. Above the Babcock bed is the buff-coloured chalky unit, and below is the grey-coloured calcareous shale unit, that is partially covered in slumped material and vegetation. property and cannot be accessed without permission of the landowner. We travelled up the Roseisle Creek valley to explore more important sites. We stopped at the old Leary's brick plant that produced bricks from 1900-1907 and 1947-1952. There used to be several brick plants across southern Manitoba, using a variety of shales and clays to create bricks in a wide range of colours. Bricks are no longer produced in the province, but if you're lucky you might spy some Manitoba-made bricks on older buildings. Shale from the Morden Member was extracted from the banks of the Roseisle Creek (pictured on the left), and produced bricks with a rich red colour. It was carried across the creek and fired in the beehive kiln (pictured on the right). The Manitoba Escarpment provides wonderful scenery and a variety of localities that are great for observing Cretaceous sedimentary rocks. Road cuts and rivers provide opportunities to work up or down section to observe how the rocks changed through time. Changes in geology represent changes in the environment the rocks were deposited in. Fossils of the animals that lived in this seaway provide important information about paleoenvironments, and the evolution and adaptation of these creatures. 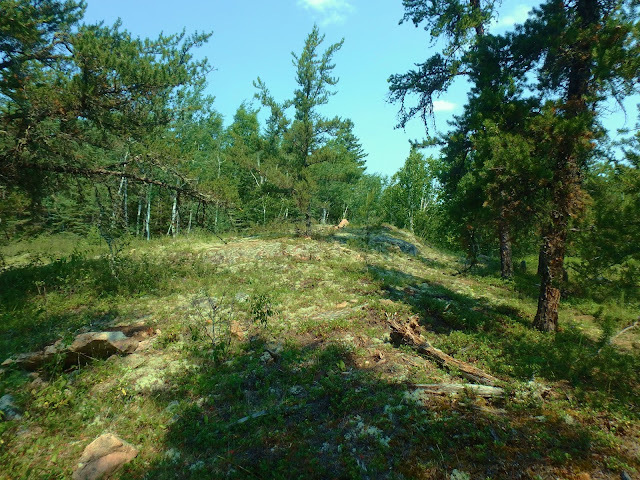 This page is dedicated to bringing you information on the geology of Manitoba, and also to show you what some of the geologists in the province are up to during the summer field season. There will be plenty of posts on exciting geological sites in the province, as well as updates on field projects and new discoveries. Visit the Mineral Resources Geoscience website for more information on the geology of Manitoba. Visit Manitoba Rocks for more information on geology education and outreach. Do you have a question about anything posted by one of our geologists? Feel free to leave a comment or question and we will respond to you as soon as possible!